Glenfiddich tastes whiskey atop Mount Everest! 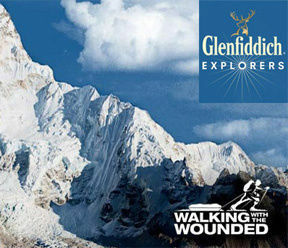 Glenfiddich seems to grab attention to charitable causes like ‘Glenfiddich for Haiti victims’ special edition bottle in the past, but now are now working for the Walking with the Wounded Everest 2012 expedition, which is about a fundraising challenge for the wounded personnel of the defense forces. The event will have 4 adventure mountaineers, 1 each from England, Scotland, Wales, and Northern Ireland, teaming up with 2 wounded defense personnel, and a guide to climb the Mount Everest. This event is all set to become the world’s highest held whisky tasting event that too at the mountain’s base camp. One of the stars of the trip would be Manindra Rai, a Gurkha who was injured in Afghanistan during the epic war there. To ensure safe journey, climbers will be given a handcrafted leather bag with necessary equipment and emergency supplies. But that will only come to use, after the whisky tasting and nosing event which will take place at the base camp. The event will actually be the highest placed whisky tasting event in the world, several thousand feet above sea level. Other than that it would raise funds towards the cause of placing the wounded personnel atop the world’s highest peaks as the pioneering spirit is about achieving truly great ‘heights’ in life.